IFE IS NOT EASY. We say this so often that it becomes a platitude. Sometimes we hate to be alive because we cannot face the many problems and situations happening to us. But there are also things that makes us love our life. One thing for sure, is when we meet great people. I have to say I was blessed in this regard. I have come in contact with some incredible people in my life. One of them, I may say with all certainty, was Divo Barsotti. This year we are celebrating 100 years since his birth (1914-2006). Who was Divo Barsotti? If you don’t know who he is, it will be like exploring a continent for the first time. He was a priest and a writer of hundreds of books, but most of all, he was a mystic. An extraordinary man. How did I come to know him? I never met him in person because at the time he was already very sick. I came into contact with him through one of his assistants when I was asked to write a review of one of his books. He sent me some autographed copies of his books (on my request) and his assistant assured me of the interest Father Barsotti had for my work on him. From that time on I became very interested in his work and read his books one after the other. 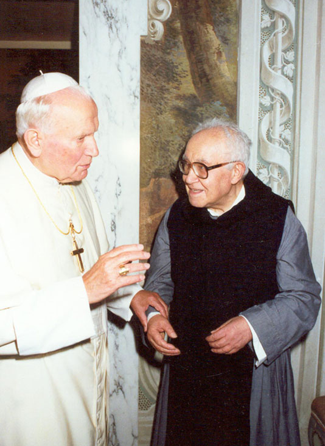 I have written two books on the studies of this great man: Abisso di Luce (Divo Barsotti and Liturgy) and Educare alla Vera Realta (Divo Barsotti and Education). These two books are intended to be part of a trilogy I want to dedicate to him. I hope to have the strength and time to achieve this. “The word has to create something because the word of God is creating word: the word of man has to obtain something, because the word of man is plea; and what the man obtains, and what God creates is the Sacrifice, act of supreme love, total answer to the love divine: Jesus sacrifice” (La Messa, pg. 65, my translation). “It is laughable to think that Christianity was exchanged for an Institute that protects the established order. Christian goes to God looking at Him and not seeing than Him” (La Fuga Immobile, Pg. 62, my translation). Divo Barsotti is almost unknown in the Anglo-Saxon world and it is really a pity. He was one of the giants of Christianity of our times.